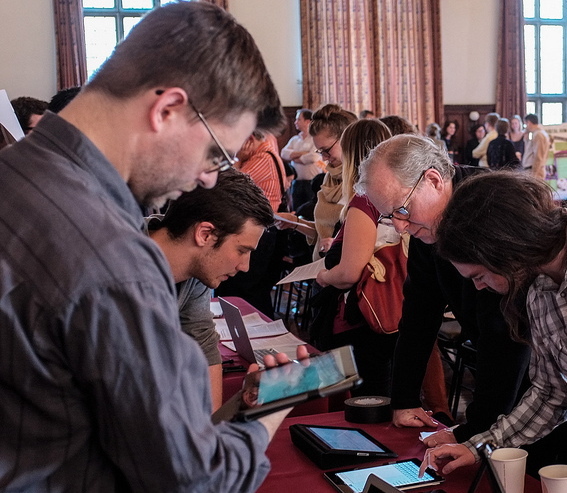 As is often the case with DH conferences, this year’s Chicago Colloquium on Digital Humanities and Computer Science was something of a grab bag. Featuring a hodge podge of panels on everything from network analysis and data visualization, to locative media and alternate reality games, the conference certainly lived up to the ethos of inclusiveness often characterized as DH’s “big tent.” And yet, despite the diversity of research questions being addressed, I also think that the conference had a great sense of coherence, with a lot of scholars operating in the tradition of humanities computing. Coming out of disciplines such as classics, English, and history, many of the scholars at DHCS were interested in mining large corpuses of data, visualizing such data, and analyzing the results to ask new kinds of research questions. Although I found many of the projects interesting, two presentations stood out as particularly relevant to the kind of work being done at Hyperstudio. On the first morning of the conference, Diane Cline from the University of Cincinnati presented a fascinating project working firmly within the humanities computing vein. Drawing on her dual background as a classicist and an intelligence analyst for the NSA, she attempted to apply the insights of network analysis and graph theory to study what she called “the social network of Alexander the Great.” Using the NodeXL program created by Ben Schneiderman (of “Direct Manipulation” fame) from the University of Maryland, Cline color-coded each edge within her network to indicate the type of relationship, whether it be family, officer, courtier, enemy, ally, or peer. Affording a kind of macro scale view which is alien to the classicist’s typical tool set, Cline argued that she was able to see “the bridges, brokers, and hubs” which were central to Alexander’s relationships, contributing a new understanding of her topic that would have been unavailable to her without the tool. This emphasis on network analysis was also echoed in Hoyt Long’s fascinating presentation on modern Japanese poetry. While many DH projects have thought about citation as a way to quantitatively measure networks of influence, Long’s presentation instead focused on less explicit metrics of influence like poetic style and content. Although these elements are less quantifiable, and thus must be coded by an expert researcher rather than automated by a machine, visualizing these influences helped Long to arrive at new insights about the relationships between different schools of aesthetic thought within Japan, as well as to discern which nodes and clusters were most central. 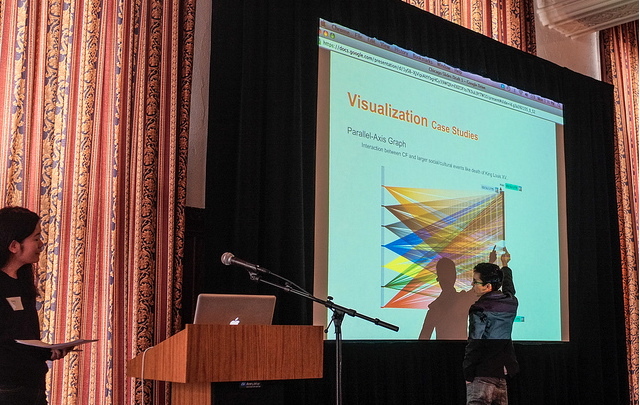 As was the case with so many of the panel discussions that day, he ended his presentation with an advocation for visualization tools as part of the humanistic scholarly process, rather than as a means to simply generate “evidence” as part of a research product. Overall, I believe DHCS was a successful conference, in that it was able to balance the impulse towards creative (and often, chaotic) interdisciplinary collaboration with a sense of common goals and directions for the future of this particular niche within the digital humanities. Importantly, it also proved to be a great space for meeting and exchanging ideas with researchers who are working on similar issues – I, for one, met many faculty and graduate students located on the east coast, and even some in the greater Boston area, who I believe have many overlaps with Hyperstudio’s research goals. Since Hyperstudio is constantly looking to strengthen its connections with other DH researchers outside of MIT, DHCS proved to be a wonderful space for both getting our ideas out there and for learning from others producing innovative projects in the field. *All photos are from Peter Leonard.